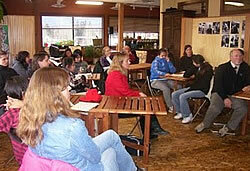 January 2009 – The Local Heroes Program was a success! The program was completed by Exshaw School’s grade 7 class. We started the program with the climate change game and challenge. The students made a great effort doing what they could to reduce their impacts on the planet and learned about reducing their ecological footprint. The students nominated about 20 people as local heroes, then narrowed down the list to 9 different people or teams of heroes. We wrapped up the local heroes program on Thursday, November 20th with a local heroes celebration. The celebration was great fun, we had nearly all the heroes come, plus we had some media show up including Rocky Mountain Outlook. Geoff from the Canmore Co-op donated the space for the celebration. We made a piece of art from garbage we found at Victory Thrift, and it will hang at the Co-op along with a letter about the local heroes program.